Well the last 7-days have been nothing short of a great week for YellowPages.ca mobile. 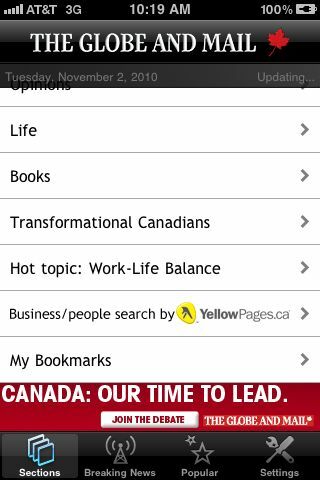 All in all, the momentum of YellowPages.ca is pretty impressive and is generating massive value for users and businesses a like. Download the Globe and Mail application from iTunes. For the full list of mobile application provided by YellowPages.ca, check out YellowPages.ca Mobile.